misc_dwrv_coin00 0.05 50 The currency of the long-vanished Dwemer race. misc_dwrv_cursed_coin00 0.05 125 Like the above - but these will summon a hostile Dwarven Spectre behind you when you pick them up. Note the values - this is how you can tell the difference. 100 The currency used throughout Tamriel. The values greater than 1 are used only for stacks of gold found sitting on tables and such. It should be noted that very little of the gold in Morrowind is "owned", although the majority of the owned gold is at the Dren Plantation for unknown reasons. 5 These are stacks of cursed gold which will summon a Dremora Lord behind you when you pick them up. These cannot be found in the game, possibly because they would not stack with normal gold, and thus they would not be treated as currency by vendors. misc_uni_pillow_unique 1.0 1 Your "reward" for completing the obscure Thelas' Pillows quest. All it does is give you a message whenever you rest, saying "Your sleep is very restful on your Extra-Comfy Pillow". 50,000* A powerful relic found in Gnisis Temple. The one on display is a fake. The real one is hidden inside the Shrine of the Mask (the Grace of Justice pillar in the center of the room), which has a secret panel that opens if you offer a Potion of Cure Common Disease. Touching the real one will Cure Blight and Common Disease on you. It will also give you the free Vivec's Touch spell, which will cure the same range of diseases on touch for a very low casting cost of 10 Magicka (primarily of use in curing the Kwama Queens of blighted egg mines in multiple quests, and for getting Cure Blight Disease on Self from a Spellmaker). Though safe to touch, despite the presence of the Ordinator, neither the fake nor real Vivec Ashmask can be picked up or taken, so the value assigned to them is meaningless. 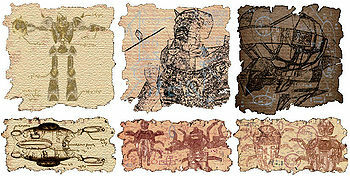 Dwemer schematics: Centurion Plans, Anumidium Plans, Airship Plans, Schematic, Scarab Plans, Scarab Schematics. 0.01 200 Only one exists, found on display in Tel Vos, Central Tower. Was required for an Imperial Legion quest that was removed from the final game. 0.1 400 You will need one of these for the Bethamez quest. 40.0 60 You will need one of these for the Free New-Shoes Bragor quest. Caius will give you one as a bribe for Divayth Fyr in the Corprus Cure quest. 2.0 10 You will need one of these for The Champion of Clutter quest in Tribunal. 0.2 100 You will need one of these for the Scarab Plans in Mzuleft quest. 0.5 40 You will need one of these for the Dwemer Tube from Arkngthunch-Sturdumz quest. You will also need one for the Ra'Zhid's Dwemer Artifacts quest. 3.0 10 You will need one of these for the Ra'Zhid's Dwemer Artifacts quest. You will also need one for The Champion of Clutter quest in Tribunal. 4.0 20 You will need one of these for the Ra'Zhid's Dwemer Artifacts quest. 3.0 30 You will need one of these for The Champion of Clutter quest in Tribunal. 8.0 40 You will need one of these for The Champion of Clutter quest in Tribunal. 50.0 100 You will need three of these for the Dwemer Warbots quest in Tribunal. * Despite its name, the "Large" "Dewmer" Goblet is visually indistinguishable from the regular Ornate Dwemer Goblet of the same shape. This glitch can be fixed to an extent, for display purposes, by opening the Console with the goblet visible, clicking the goblet once to get its ID to appear at the top of the Console window, and entering the SetScale 1.5 Console command. It will revert to the original size if picked up and put down again, and other goblets of this sort you may encounter will not have been resized. All but one of these are found in various tombs across Vvardenfell. 1.0 1 Dedicated to the father of developer Gary Noonan, who passed away during production of the game. 1.0 0 Dedicated to a former regular at The Elder Scrolls Forums, who passed away during production. 3.0 100 Dedicated to a character used by developer Steve Meister for testing the game. This Easter Egg is found in a storeroom in The Lizard's Head, Vivec, presumably giving the inn its name. This page was last modified on 18 October 2018, at 08:10.